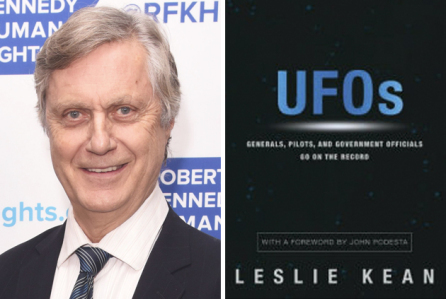 EXCLUSIVE: Director Lasse Hallstrom and producer Laura Bickford are teaming to make a movie based on investigative reporter Leslie Kean’s bestselling book UFOs: Generals, Pilots, and Government Officials Go on the Record. Kean is one of three reporters who broke the widely-covered, recent story on the front page of the New York Times about the existence of a Pentagon UFO program called the Advanced Aerospace Threat Identification Program which has secretly been in operation since 2007. Book was optioned by Bickford, who produced Traffic, Che and Arbitrage and was exec producer of Beasts of No Nation along with partner Fiona Druckenmiller, who’ll be exec producer on the UFO pic. Hallstrom will direct. He is coming off A Dog’s Purpose, and wrapped for Disney The Nutcracker with Keira Knightley, Mackenzie Foy, Helen Mirren, and Morgan Freeman. The script was written by Wendy Button, a former speechwriter for Hillary Clinton and John Edwards. The first woman to be a chief speechwriter on a presidential campaign, Button has numerous film and television projects in development. The filmmakers have been working over the holidays to incorporate new information which recently came to light into the script and Kean spent over a decade studying hundreds of U.S. government documents, aviation reports, radar data, and official case studies on UFOs. The UFO events depicted in the film will be true and recreated based on real documents, data, and witnesses’ first-hand accounts. Foreward was written by John Podesta, who ran Hillary Clinton’s 2016 presidential campaign. The film tells the story of Kean’s journey while reporting on Unexplained Aerial Phenomena and will recreate some of these real events as they actually happened. “The recent story in the Times has increased recognition of the seriousness of the UFO question and has focused attention on it worldwide. More coverage will continue to position this issue front and center during the coming year,” says Kean.